I've seen this a few times. Why the splat (*)? oh now you guys gone and done it. 8O shame, shame. Vote here for Aquarium Advice!!! oh now you guys gone and done it. Nope not me, I dont' even own one so... pleco, pleco, pleco. 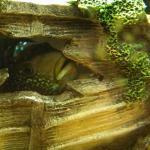 They may explain why my pleco got hemorraghic septicemia--but we treated early and he is recovering. What about pleco deaths before the internet was a popular medium for communication?